Kafieris Apartments On the Cliff is a traditional complex of luxurious apartments with Caldera view in Firostefani Santorini island. 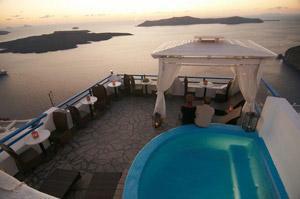 The unit is located at the highest spot of Fira in Santorini, and only 500 m from the center of the village. Our rooms can accommodate from 2 to 5 people and feature TV, air conditioning devices, kettle, safe deposit box, daily room service, and some of of our room types have a private balcony with incredible Caldera views, in order to enjoy unforgettable sunsets. We also offer Jacuzzi.